Authorities in Singapore say they’ve seized what is the largest illegal shipment of pangolin scales in the world in recent years, after discovering almost 13 tons in a container en route from Nigeria to Vietnam. Customs officials along with the National Parks Board inspected a 40-foot container at the Pasir Panjang Export Inspection Station and discovered the pangolin scales in a shipment marked as frozen beef. 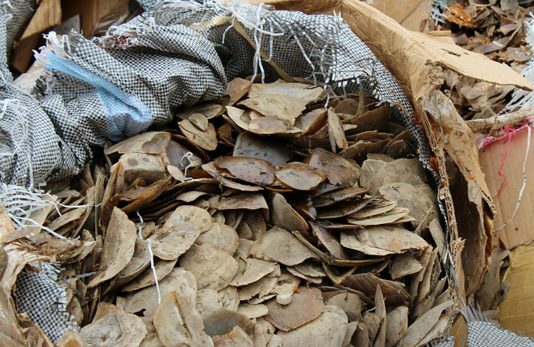 Instead, they found USD$38.7 million in pangolin scales along with elephant ivory worth $88,500. Pangolin populations have been devastated by poaching, including at least 80 percent of pangolins in Asia, and illegal trade continues despite a 2016 treaty of more than 180 governments agreeing to protect the endangered species.